Inspired by a new season (I love Autumn – beautiful days, crisp evenings, the promise of boots and scarves…), and spurred on by my friend Sas’s return to blogging (you’ll find her at oneequalstwo), I have decided it is time for my first post of 2105. The crate of pears in the laundry prompted me too. Dad delivered them the other day, picked from the trees my partner and I planted along the corrugated iron wall of the shearing shed. We’ve been surprised at how well they’ve done – the ground is stoney and the iron gets very hot in summer, but they’ve thrived. Dad’s kept a close eye on them of course, and kept up the water all summer, so we’ve had a fabulous crop. I was going to bottle them, but I waited a day too long and they were a bit ripe, so instead I stewed some for breakfasts and turned the rest into sweet treats for the long weekend. 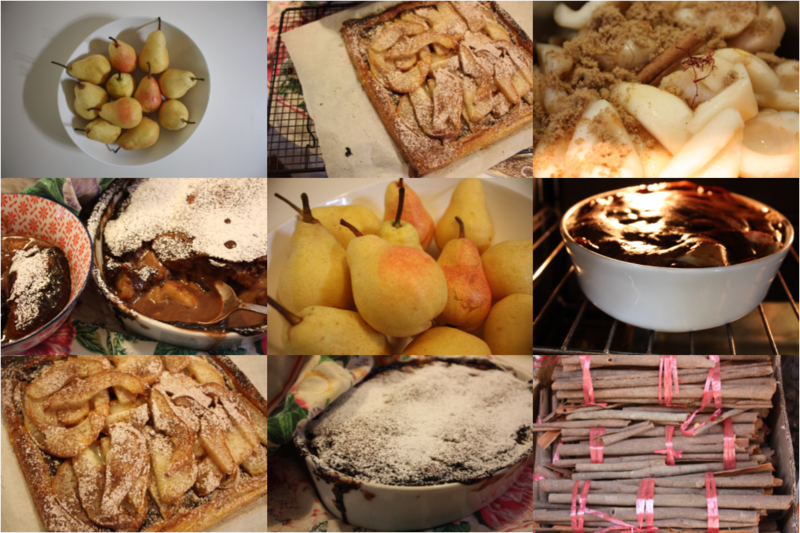 Pears go with chocolate like a Young Marrieds Group goes with 1951, so I made an old favourite that we call Capricious Pear Pudding (a name I’ll explain in another post – it’s a long story) and a Chocolate Pear Tart. The subtle sweetness of pears seems to call for spices – cinnamon, cloves, nutmeg and cardamon all work well. We’ve recently returned from a trip to India, and in Delhi, where we stayed at the lovely Devna B & B, our host David took us into the old town, including to Paranthe Wali Gali (yum!) 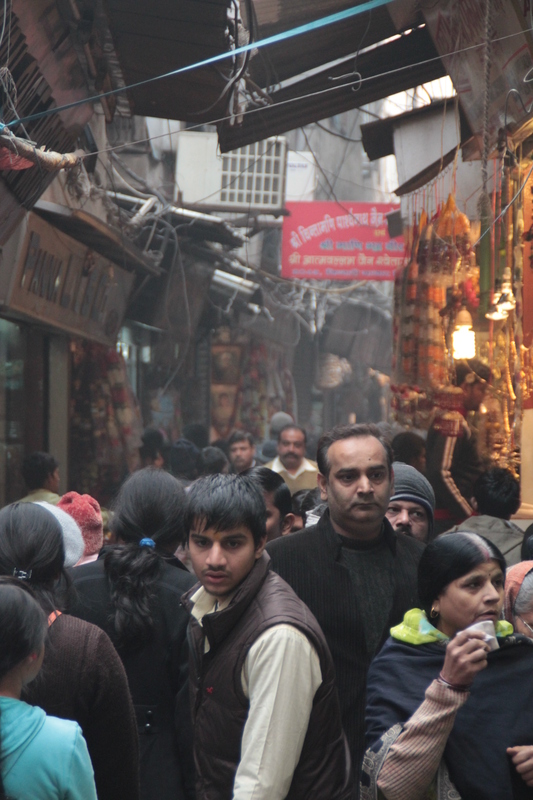 and the spice markets. This afternoon I cooked my pears with some of the saffron and cinnamon we bought there. They’ll make a perfect Autumn breakfast – porridge with stewed fruit, toasted almonds and a dollop of Greek yoghurt. PS Banana Paranthe would make a perfect breakfast too – I’m on the hunt for a recipe, though it will never taste as good as in Delhi. 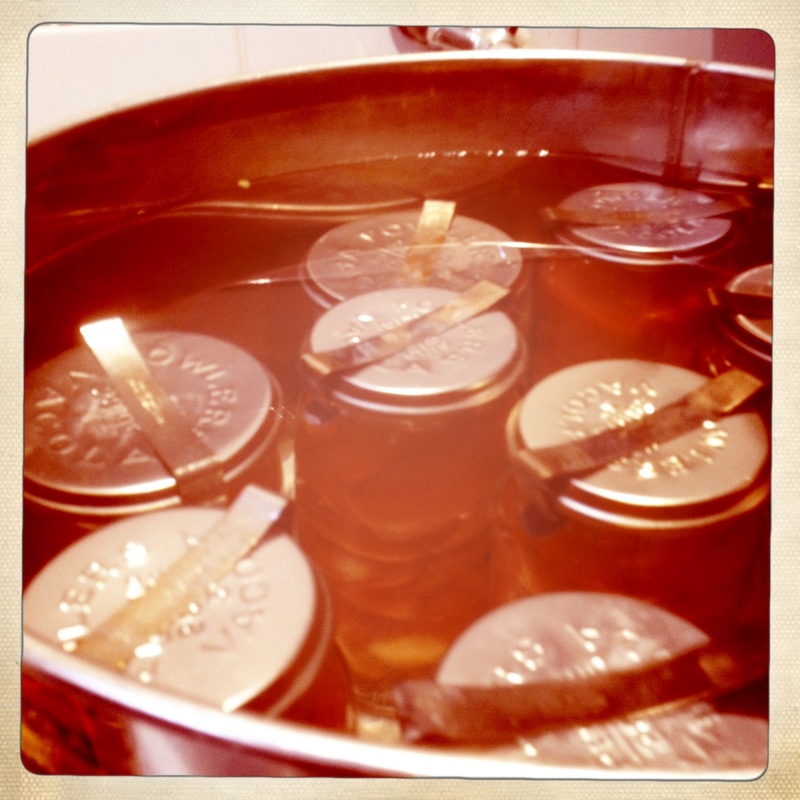 I must say that my first inclination on a very hot day – and we’ve had more than our fair share lately – is not to crank up the bottling or make jam. Not that bottling is something that can generally wait. I remember as a teenager (not desperate to help) that cases of fruit always seemed to appear on the hottest days. Mum had the Vacola set up in the laundry, which was outside, but I’m not sure how much difference that made. Warracknabeal in February is hot, and before we had air-conditioning installed in the late 1970s we relied on a portable evaporative cooler, sometimes with a huge block of ice perched on a stool in front. 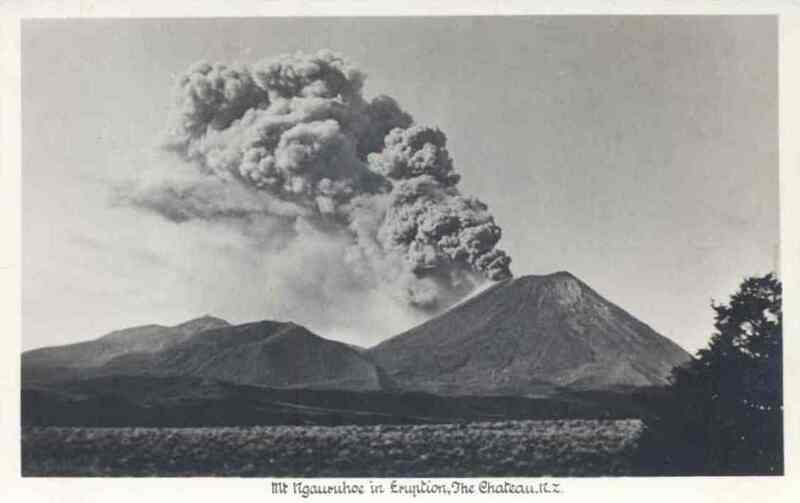 Of course, in 1949 Ngaire wouldn’t have had anything remotely advanced in the way of cooling, especially in Christchurch where the summers are generally much milder. I don’t imagine she would have lowered her dress standards too much either, no matter what the temperature. 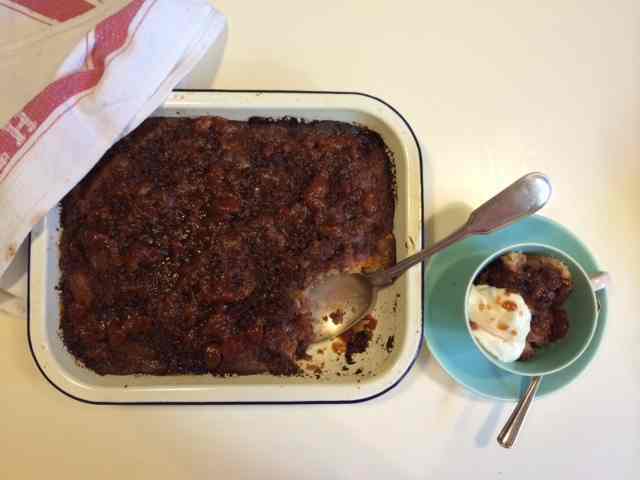 While I’m keen to walk in Ngaire’s footsteps, I really couldn’t be bothered bottling today and since I didn’t have any fruit waiting to be dealt with I made a pudding involving plum jam instead. Homemade jam of course, though not by me. Thanks Andrea Webster! Cream butter and sugar. Add egg and beat well. Sift in flour and other dry ingredients. Add milk and lemon essence and mix well. Turn into well-buttered and floured baking dish then make topping. Topping: Rub 1 tbsp butter into 1 tbsp cinnamon and ½ cup sugar. Sprinkle over the cake mixture. Bake at 180° for approx. 30 mins. Sauce: Combine 6 good tbsp jam with 1 cup of water and heat. Allow to reduce until thickened but still easy to pour. Pour the sauce over the warm cake, reserving some for serving. Serve with cream or ice cream then have a nice lie down and congratulate yourself on having cooked anything at all on such a hot day. Postcard found at Skufan Postcards. A week or so ago I spent a few days at a writing retreat in a cottage near Lancefield. The nights were freezing, but the days were beautiful with brilliant sunshine and clear blue skies. The last of the autumn leaves were hanging on and, on one tree, so were some large rosehip-like fruit which Rob (the caretaker) identified as medlars. A member of the rose family and originating in the Middle East, medlars are supposed to have been popular in mediaeval England and Europe. Less romantically, they were known as ‘open arse fruit’ due to their appearance. Ngaire wouldn’t have been impressed. It seemed a shame to leave them to the birds and possums so I picked the last of them and promised Rob a jar of whatever I could produce. That turned out to be a very pretty jelly, with a flavour that you can’t quite place. 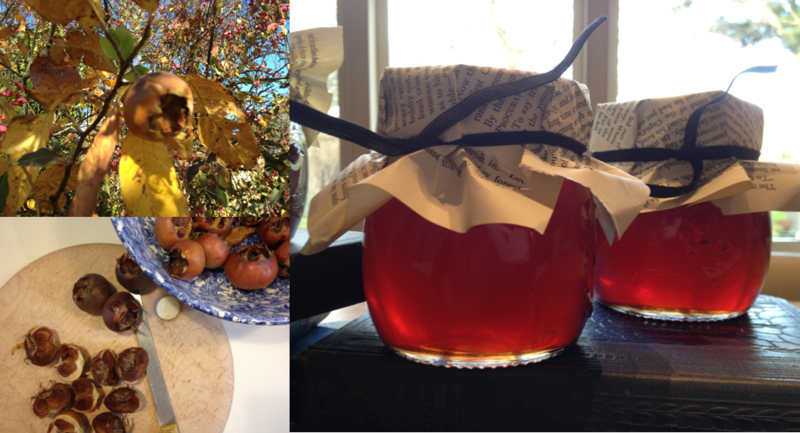 As with quince jelly and paste, medlar jelly is delicious with cheese and meat. I started with Jamie Oliver’s recipe, but added some rosemary and a little more lemon. The key thing to know about medlars is that they must be bletted (allowed to rot) before cooking or eating. That explains why the local wildlife hadn’t finished them off. Lemon pips and decent sprig of rosemary tied in muslin. Rinse the medlars then halve and place in a large heavy-bottomed saucepan. Cover with cold water, bring to the boil then simmer until soft. This takes about 1 hour. Pour the mixture into a jelly bag and hang over a large bowl. Leave overnight to allow the liquid to drip through. The next day, measure the extracted liquid and pour into a clean heavy-bottomed saucepan. Add 220 g sugar for every 300ml of juice, then the lemon and the muslin bag containing the pips and rosemary. Bring to the boil and boil rapidly for about 12 – 20 minutes. Test for setting by spooning a little on a chilled saucer. Don’t boil for too long or it will be too firm. Carefully pour into sterilised jars while hot. Cover and leave to cool before screwing on the lids. By the way, if you’d like to know more about the Doris Lusk painting I recommend Cheryl Bernstein’s blog. I remember going to the Kaiapoi lemonade works with my grandparents as a child; on visits to Christchurch it was one of the first stops. ‘Fizzy drinks’ were a special treat in our house, so being allowed to select a mixed dozen was beyond exciting. 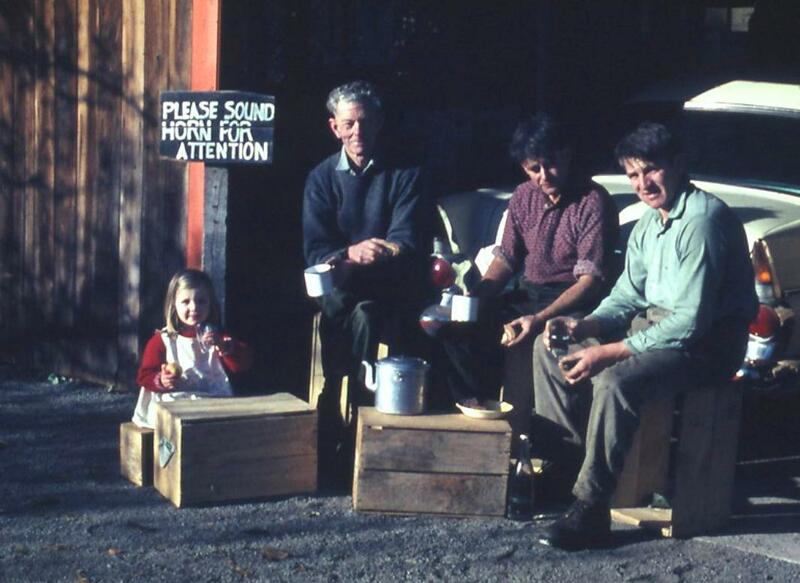 I still associate lemonade with morning tea at the orchard, sitting outside the packing shed in the sun, or on the front veranda of the house. If lemonade still came in glass bottles I could have used them for the sauce we made today. 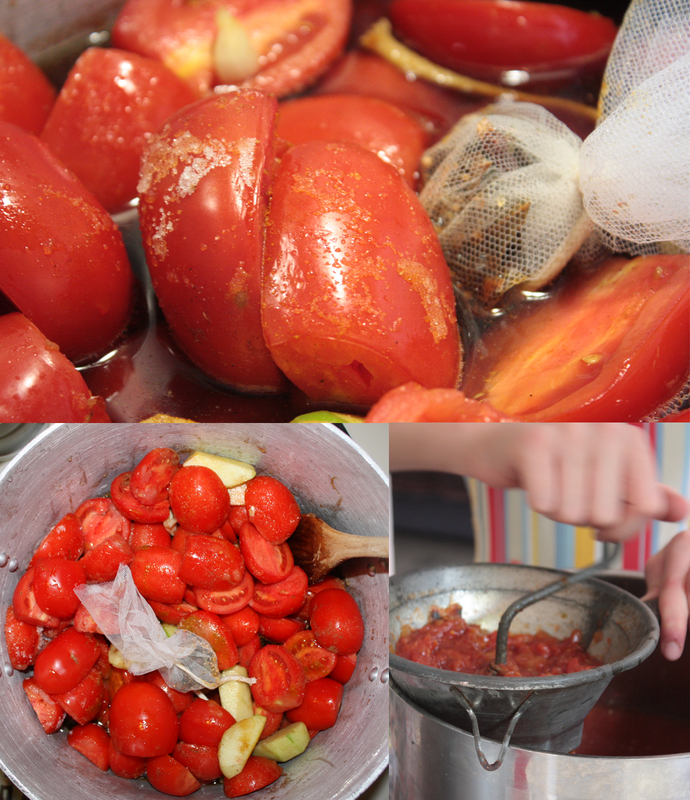 My thirteen year old has been wanting to make sauce ever since we stayed with our friends Ashley and Chris in Canberra last year. They make a fabulous batch every year, and the bottle we brought home with us lasted no time at all. 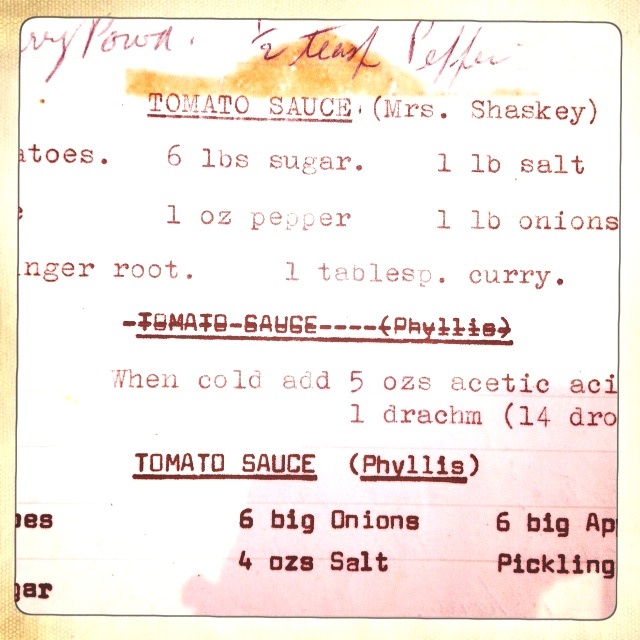 There are two recipes for tomato sauce in Ngaire’s book – one from Mrs Shasky (a neighbour in Prestons Road), and the other from Auntie Phyllis. We went with Auntie Phyllis of course, but I reduced the amount of vinegar and added garlic and ginger root as recommended by Mrs Shasky. 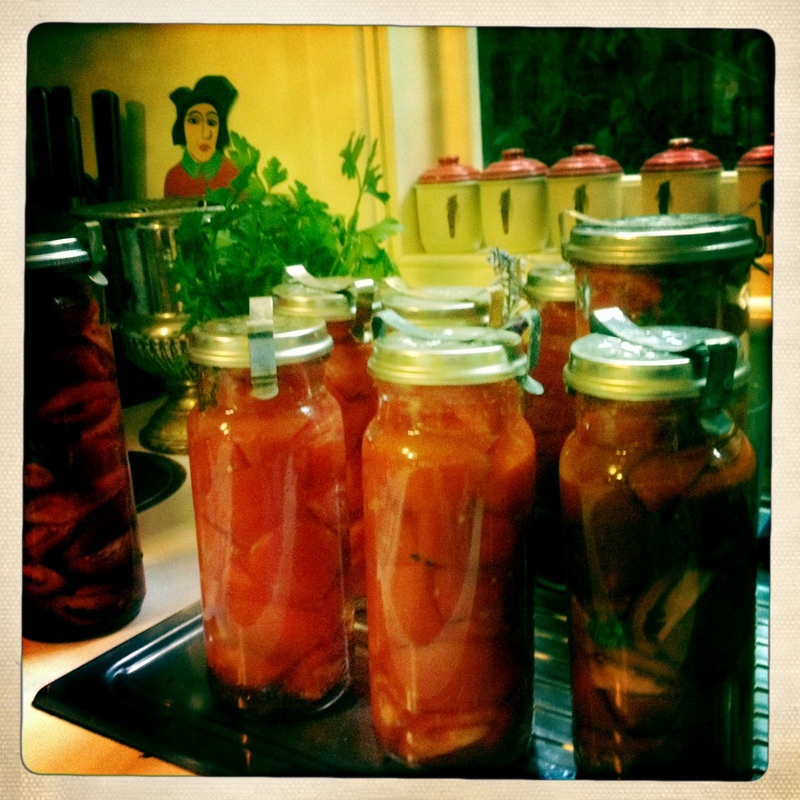 Max chopped all the tomatoes, operated the Mouli and tasted the brew at very regular intervals! We were a bit worried about the acidity at one point but, thanks to some quick Googling, managed to correct it by adding a grated carrot and baking soda. 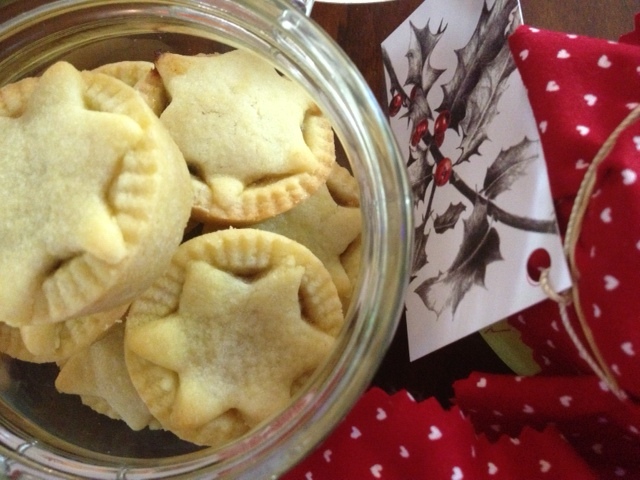 We’re very chuffed with the result – what’s the point in homemade if you can’t brag about it. 12 lbs (5.4 kg) tomatoes, 6 big onions, 6 big apples, 3 lbs sugar (1.4 kg), 4 oz (115 gms) salt, pickling spices (tied in netting), 1/4 gallon malt vinegar (1100 mls), 1 large carrot (grated) 4 cloves garlic, large piece of ginger root, 1 heaped tablespoon cornflour, 1 heaped tablespoon curry powder. Peel and core the apples then roughly chop along with the tomatoes, onions, garlic and ginger. Put in a large saucepan with the pickling spices, sugar, salt and vinegar (reserve about 1/2 cup for later). Boil for 1 1/2 to 2 hours, stirring from time to time. Add the grated carrot towards the end of the cooking time. To thicken, make a paste with the cornflour, curry powder and reserved vinegar. Mix in some of the hot liquid then gradually stir the mixture into the sauce. Bring back to the boil, stirring constantly. Turn off and allow to cool. When cool, put through a Mouli and bottle. Note: If you’re concerned about the acidity, adding Baking Soda will help. Add 1 teaspoon at a time, checking the taste as you go. Boiling the mixture for too long will increase the acidity. This morning I went to the Travel Club. Miss Ngaio Marsh was the speaker and she told us about her trip to England in a small Norwegian cargo boat, via the Dardanelles and the Russian port Odessa. Each bale of wool landed there was pierced by a bayonet, just in case someone was inside it trying to smuggle into the Soviet. The cabins were searched by armed police, and they were not allowed to converse with the watersiders. The Soviet women were tremendous, and worked like men. Ngaio Marsh must have been quite a coup for the Travel Club, although of course she was a Christchurch girl. ‘Singing in the Shrouds’, her twentieth novel, was published the next year and involves a serial killer on a cargo ship. I had writing group last night. Perhaps I should suggest we become the Writing Club. I came home full of ideas and resolve, but was brought back to earth by a large box of tomatoes. It didn’t land on me or appear from nowhere; I’d just forgotten about it. 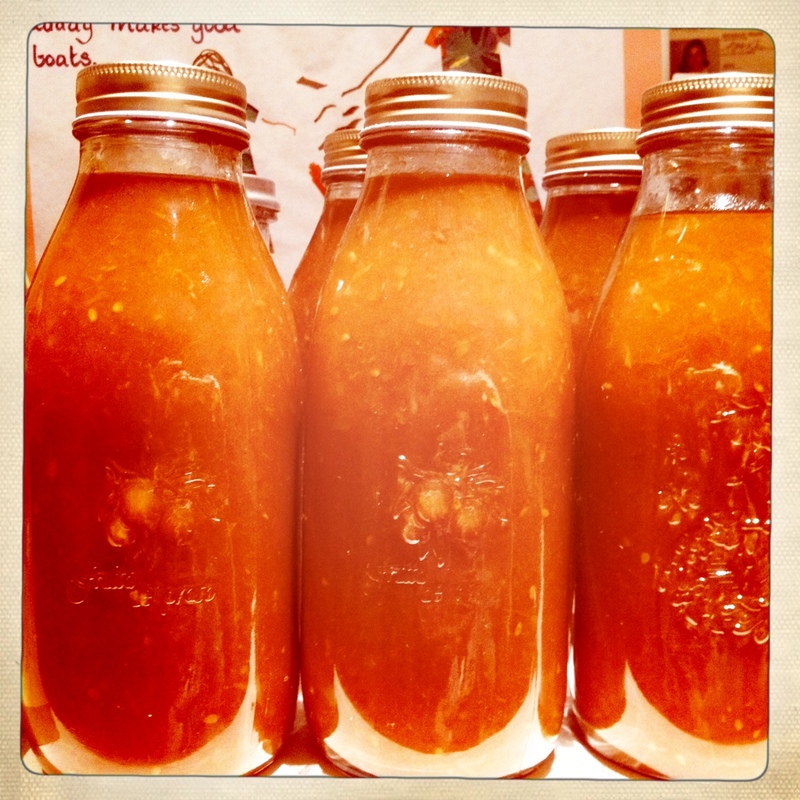 The tomatoes were being a bit belligerent, in a ‘we won’t keep all week you know’ sort of way, so I cut them up and packed them into bottles before going to bed, then put them through the Fowler’s Vacola this morning. I put a sprig of marjoram and a good pinch of salt in each jar and, as recommended by Fowlers, some citric acid to assist preservation. Tomatoes are easier to deal with than fruit (and significantly less sticky), which is just as well because I have another two boxes coming this weekend. One will be for sauce, and the other passata (why on earth would you say ‘puree’ when you can say ‘passata’). 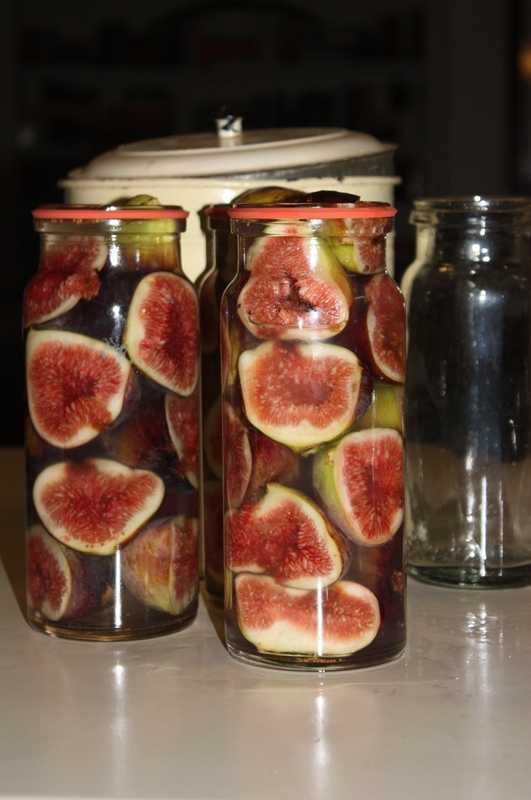 Up early this morning – it’s too hot to sleep properly and Alex had rowing training – so I went to the market and came home with a small box of figs. I’ve been keeping an eye on my neighbour’s tree, hoping the possums will leave enough for me to suggest a trade of eggs or apples, but they’re a fair way off ripe so I couldn’t resist buying some, despite the price. I’ve kept a few for eating fresh and bottled the rest. 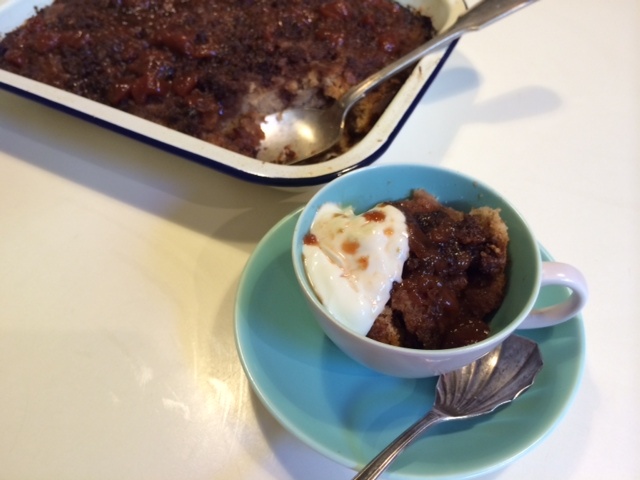 Later in the year, when summer is a distant memory and the idea of a hot day is attractive again, we’ll have them for pudding, gently warmed and served with thick cream. I’ve got the knack of bottling now and have learnt not to be overly ambitious, just doing a batch in the evening as Ngaire did, rather than dozens of jars in a day. 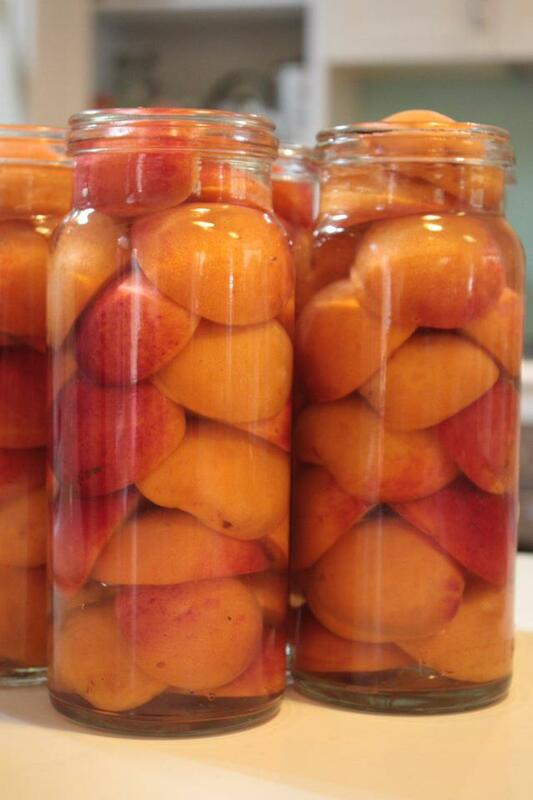 Having the preserving kit set up in the laundry makes all the difference too. It does add to the degree of laundering difficulty – now I have to separate lights from darks and smalls from syrup — but at least I can close the door on it. Carol and Warwick went to bed at 10pm after filling our pillow cases. Gerald and I have filled theirs and they are now fast asleep, for how long I wonder? They are greatly excited. No partridges actually, just two frightened chickens. We lost the other five to a fox a week ago, and it has been with a very heavy heart that I’ve used the last of their eggs in the Christmas baking. They were very trusting and dependable (an egg each nearly every day), and I wish I’d been able to better protect them. One very elaborate ginger bread house made by Alex. I love giving and receiving gifts of food at Christmas. 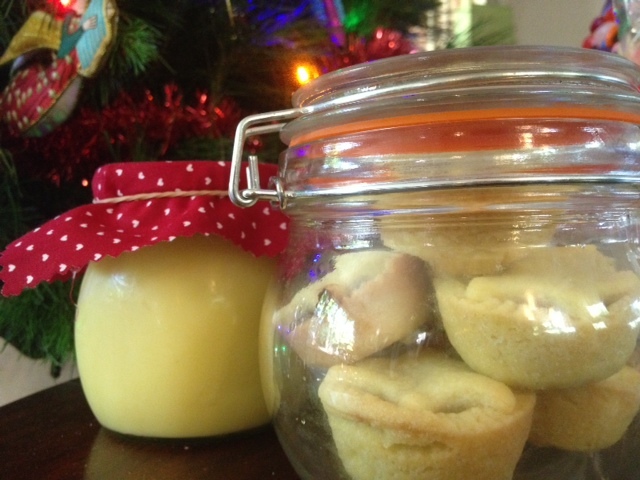 My New Year resolutions are compromised every year by Mum’s macadamia shortbread and festive fruitcake, Mavis’s mince tarts and tomato relish and Nanette’s sugar-coated shortbread and zucchini pickles. May this year be no different. made the Christmas pudding and put it on to boil. It’s going to be a late night. I wish I had time to thoroughly clean the kitchen and bathroom. With that sort of time on my hands I could finish sewing the dress I cut out last winter, crochet some more squares for the afghan rug I’m making with a group of friends, trawl the streets for discarded wooden pallets to build boxes for the vegetable garden I’ve been planning forever or…go to bed and read my book in time for book club. 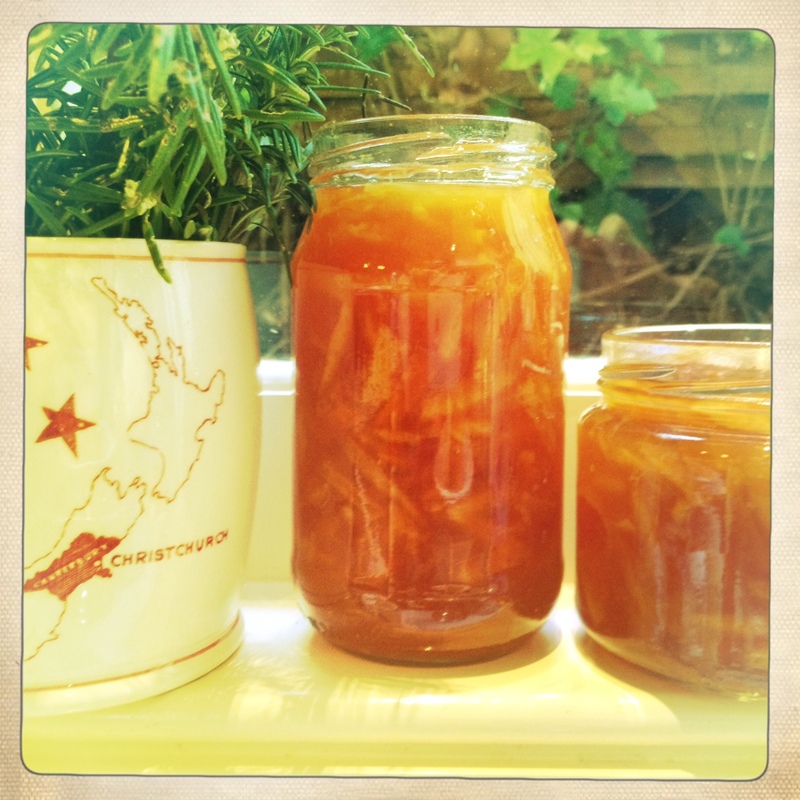 The truth is I seem to have lost the art of being idle (damn that Protestant work ethic) so, finding myself with a couple of spare hours, decide to make Cousin Dorrie’s marmalade. 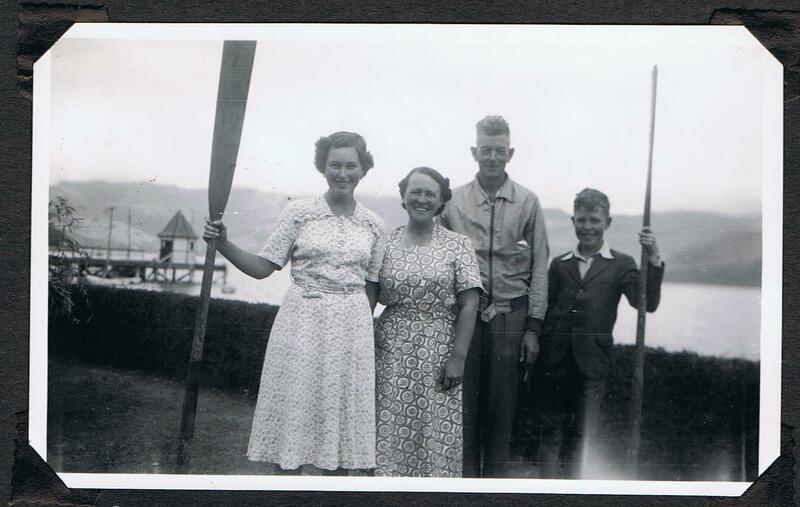 Dorrie Coe was Ngaire’s first cousin on her father’s side (and later, also her step-first cousin on her step-mother’s side, but that’s another, convoluted story). Dorrie and her sister Vera were both accomplished cooks, and their recipes appear throughout Ngaire’s book. Anyway, Dorrie’s marmalade recipe calls for four Poorman oranges which, outside of Ruth Park’s novel Poorman’s Orange, I’ve never heard of. As it turns out there’s a link. Poormans are supposed to have particularly good rind for marmalade making, so it’s a bit disappointing that I can’t put my hands on any. I’m sure that, given a little time, I’ll be able to track some down, but for this batch I settled on a substitute of one ‘real’ grapefruit, two mandarins and two Seville oranges. The second interesting ingredient in Dorrie’s recipe is brewer’s crystals which, after much searching, I’ve decided simply means sugar. I found a gorgeous article about marmalade in the Sydney Mail from June 1922 which says ‘there are some women who like to use brewer’s crystals for all their jam making. Personally I have used it, and found the brand very good. Still, I have made great successes with what we usually term ‘soft’ or cooking sugar, and for everyday use this is nice enough for anything.’ An article titled ‘Jam and Jelly Making‘ in a 1935 edition of the New Zealand Railway Magazine also mentions crystals, saying ‘use pure white sugar — brewers’ crystals for preference.’ If anyone can tell me anything more about brewer’s crystals (or Poorman oranges) I’d love to hear from you. Ingredients: 4 Poorman oranges (or substitute a mixture of grapefruit, oranges and mandarins), 2 sweet oranges, 2 lemons, water, white sugar. Peel off and discard as much of the white pith as you can from the flesh. Also discard pips then put the fruit into a food processor and pulse until pulp. Add the peel to the juice and weigh. For each 1 kg add 500 mls of water. Write down the weight – you’ll need the figure again. Add the bag of pulp (you need this for the pectin) to the juice/peel and let stand for 24 hours. The next day, boil until the rind is tender (approximately 1 hour). Once cool, squueze all juice from the bag of pulp then discard. Let the mixture stand for another 24 hours. 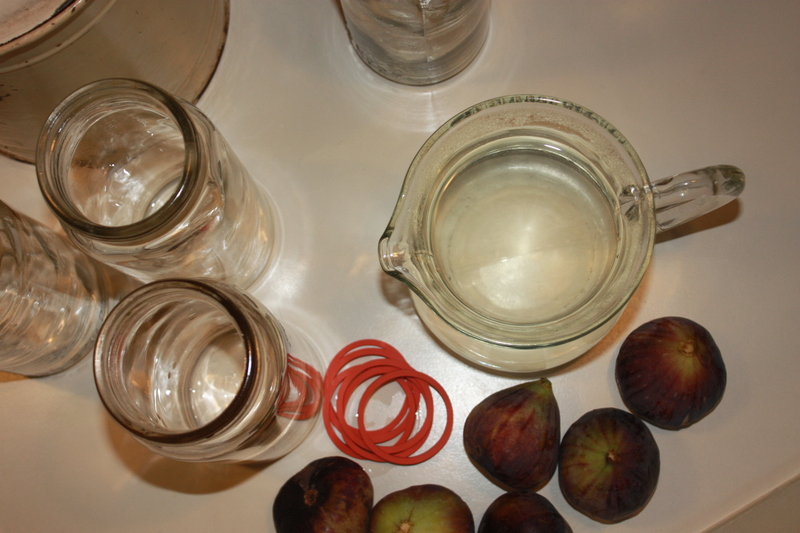 The following day, sterilize jam jars and lids (I put them through the dishwasher on hot). Bring mixture to the boil again. Add 1.25 kg of sugar for every 1 kg of juice/peel (i.e. the original weight) and stir until dissolved. Boil hard until the marmalade reaches setting point (test by spooning onto a cool saucer and putting in the fridge for 5 minutes). Allow to cool a little then pour into jars. Delicious on toast for breakfast, in a steamed pudding, as a glaze on pork or slathered on fresh bread and eaten in bed while you finish your book club book.